Now through Monday April 25th Midnight PST. you can score a FREE pair of designer sunglasses from No More Rack. Log in to your account or join here. New members will get a $10 gift code when they join. Once you are signed up, use your referral code to refer at least 17 friends and you’ll nab a 1 of the 2 pairs of sunglasses shown above. Your first 5 referrals will nab a $10 gift code when they use your link. 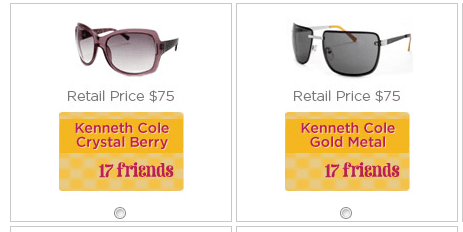 If you refer more friends you will get to choose from the additional sunglasses listed here. Please feel free to leave your referral link in the comment section for others to use. Free sunglasses! Such a great deal! !